Bitcoin transactions have risen to their highest level in more than a year, suddenly spiking to about 400,000 transactions a day. That’s double the amount of activity it was seeing just four days ago, rising from about 220,000 transactions on the 24th of March to 390,000 on the 28th. 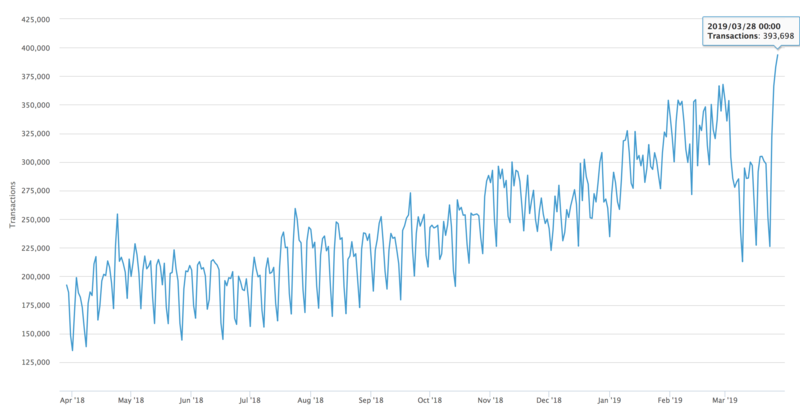 Bitcoin transactions spike, March 2019. What caused the spike is unclear but we can see at the beginning of the month bitcoin was handling 350,000 transactions a day with it then suddenly plunging as Venezuela sees the biggest electricity blackout in its history. “Cities across Venezuela recovered electricity on Thursday after the blackout, the second major one in less than a month. Venezuela handles about $10 million worth of bitcoin trading volumes on the peer to peer exchange Localbitcoins, far more than all of America or Europe. 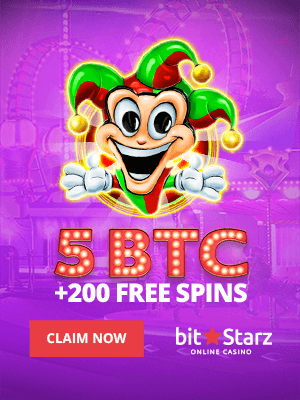 It is unclear however whether this is just a coincidence, or whether there’s a causative relationship between the blackout and bitcoin transactions. Some in Venezuela were saying that banks and other vital services were not running during the blackout, while bitcoin was still on. There were suggestions they were using bitcoin text services to send or receive BTC through sms, with Venezuelans able to access the bitcoin network even during a nationwide blackout. 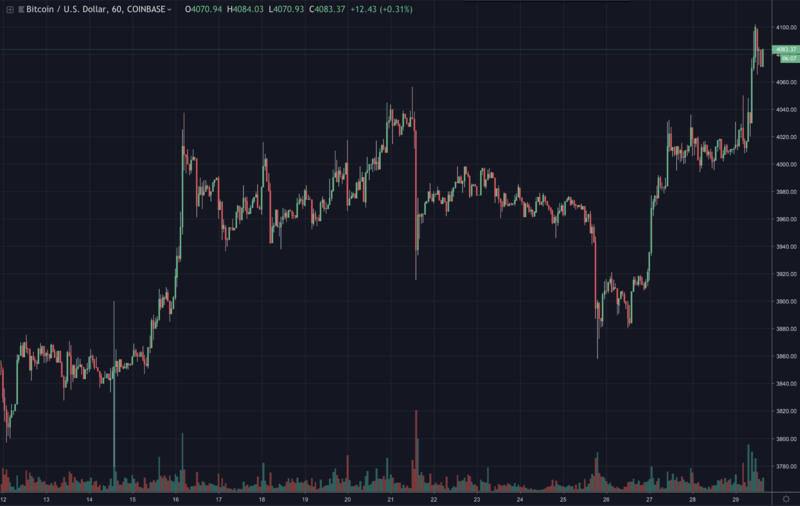 Bitcoin’s price on hourly candles, March 2019. Bitcoin has been up for much of the month, rising to about $4,100 at the time of writing with reasonable green volumes. It is currently processing on-chain about $5 billion worth of transfers a day, with the Brexit deadlock potentially benefiting the crypto currency as Brits might be hedging some of their falling Pound.